Waveforms are often used as visual metaphors for sound. In actuality, the shape of the waveform is a poor representation because you can only see the top 30 dB of the harmonic content - the rest is hidden in the thickness of the line that is used to draw the waveform and other difficulties of trying to represent a large dynamic range in a medium that has only a tiny dynamic range (a waveform diagram). But the metaphor is useful, and as long as the sound is the important thing, then crude waveform diagrams are acceptable as symbols. 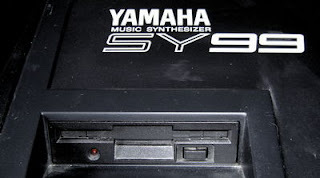 Possibly the most interesting use of sounds that were presented as waveforms was in the early 1980s, when German synthesizer pioneer Wolfgang Palm and his company, PPG (Palm Products GmbH) produced a series of leading-edge 'wavetable' synthesizers that used digital techniques at a time when analogue was king and Yamaha's DX series of FM synthesizers were being developed in Japan. Digital synthesis in a popular and affordable form is often credited as appearing with the DX7, but PPG's 'Wave' series of wavetable synthesizers used (for the time) sophisticated digital sound generation with analogue filtering and enveloping. By changing rapidly from one waveform to another - called sweeping' through a table of waveforms (a wavetable) - the sound generation produced much more complex and evolving sounds than more conventional synthesizers of the time with sine, square, sawtooth and triangle waveforms. I was hooked, and I've been a champion of wavetables ever since, although I also have weaknesses for FM and additive synthesis too, and I'm very confortable with subtractive synthesis. So when I heard that a new Live Pack was available for Ableton Live, that provided lots of waveform samples and used Live's Instrument Racks and Simpler sample replay engine to produce wavetable-like sounds, then I downloaded the demo, auditioned the sounds, and liked what I heard. Very soon afterwards, I bought the complete set: Waveforming, from MESA+ (and not to be confused with the Dutch Nanotechnology research institute). Waveforming provides 66 multi-sampled wave-samples, 270 Instrument Racks (plus Simpler Presets) as well as a few drum kits, sound effects, and sample songs (provided as Live Sets, so you caan delve into them and see exactly how the sounds are used in context!). The sounds cover a wide range, and fall into very few of the classic wavetable cliche traps. I was very impressed with the breadth of sounds, and their usability - I was able to find timbres to fill all the niches I wanted, and overall the sounds seemed fresh and very usable (as well as offering lots of customisation options through macro controls, and lots of room for making new sounds by using the supplied samples). Of course, sound is very much a personal thing, and so these are my own subjective opinions, but I think I'm going to use the Waveforming sounds a lot! Thoroughly recommended - try out the demo and see if your ears like it too! 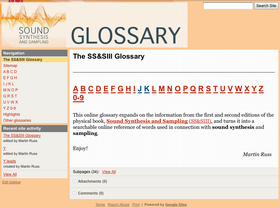 The glossary from the first and second editions of my book, Sound Synthesis and Sampling, is now available online - at least partially. I am still adding entries, and expect to be finished soon. Then there are some graphics to be finalized. Until then, I thought that you might like to get an advance view before anyone else. I've just updated the section of my web-site where I document my experiences with the SY99 floppy disk. New, better-quality pictures, tables, lots of links, and a lot of information. A veritable SY99 floppy-fest, which may also be useful to SY77 and V-50 owners.